These documents will help you to find what we have available in our archives. The bound volume collection for St Lawrence County includes material on county government as well as other material that is of a county wide nature. There is a general county collection, separate collections on county courts, the sheriff’s department, and county jails, as well as a collection of material on the county home, farm, and welfare system. The latter is restricted and not open to public access, due to state law. Some of the jail materials are also restricted. The bound volume collection includes account books, diaries, business ledgers, assessor’s books, and other records. The 400 plus volumes have been organized by township. Oversized volumes are located on the top shelf. The Civil War Collection is a group of resources designed to illustrate St Lawrence County's participation in the Civil War. Resources include diaries, memoirs of soldiers, letters home, regimental histories, histories written by participants, and secondary works. We have organized the collection by unit. Any non-unit-specific materials are located in later boxes according to their labels. This finding aid lists each item by box, then alphabetically by the author's last name. It also includes a list of the units represented in this collection as well as the list of soldiers and their respective units. A list of primary and secondary references is listed alphabetically at the end of the finding aid. Dan Spafford Giffin was born in Heuvelton, NY, in 1837 and died there in 1907, in the same house in which he was born and raised. He was the son of Nathan F Giffin, one of the first settlers in the area. During his life, Dan Giffin worked as a teacher, merchant and, for more than forty years, lawyer. He also fought as a Union soldier in the Civil War. Giffin married Mary C Shepard, giving him a relationship to both the Shepard and Butterfield families, and had two sons and a daughter. He was also an avid writer of history and poetry. The D S Giffin collection was donated to the St Lawrence Historical Society by Florence Giffin Johnson (formerly Martin), who was Giffen’s granddaughter. The collection contains a great deal of personal correspondence between Giffin, his wife, and their relatives, as well as personal pocket diaries, legal documents from Giffin’s years as an attorney or relating to the family, and Giffen’s historical writings. There is also some genealogical information on the Giffins, Shepards, and Butterfields, as well as family photos. Abbot Augustus Low, son of Abiel Abbot Low, was born on May 12, 1844 in Brooklyn, New York. An entrepreneur and an inventor, his interest in the Adirondack Mountains brought him to the Bog River area near Tupper Lake where he then developed the community of Horseshoe. He started the Horseshoe Post Office, becoming the first postmaster there, and the Horseshoe Railroad, which went into the Sabbatis area where Low started his lumbering company and where he built two dams, creating power to serve his home, bunk house, and many lodges. Low was an avid sport hunter and fisherman, and died September 25, 1912. The A A Low collection is more of a business collection than a personal one. 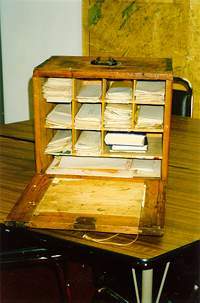 (A small personal file can be found in the Family Files in the Research Room.) The collection includes information on and correspondence about the companies owned by him and those affiliated with him, as well as a great deal of information on the series of lawsuits brought against Low by New York State for flooding the lands at his dams; these suits went on after Low’s death, pursued by his sons (A A, Jr and Seth) and their families. Old Yale books, personal books, maps, and many statistics on the dam and reservoir are in the collection. More information on A A Low can be found at the Adirondack Museum in Blue Mountain Lake, to which he donated directly. The provenance of the collection at the St Lawrence County Historical Association is not clear. Finding aids are PDF files, run under 200K in size, and require some form of PDF reader.